Britain's anti-immigration, anti-EU UK Independence Party (UKIP) lost its only MP on Saturday when Douglas Carswell quit the party. 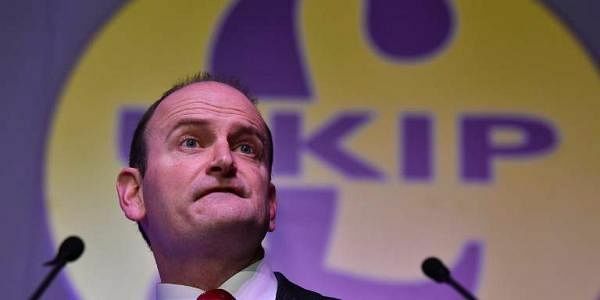 LONDON: Britain's anti-immigration, anti-EU UK Independence Party (UKIP) lost its only MP on Saturday when Douglas Carswell quit the party, just days before Prime Minister Theresa May is to launch the formal Brexit process. Carswell defected from the ruling Conservative Party in 2014 to become the only UKIP member of the 650-seat House of Commons, but he has long been at odds with the party's founder, Nigel Farage. In a blog post, Carswell said the party had played a leading role in last year's referendum vote to leave the European Union, but it was "job done". "I will leave UKIP amicably, cheerfully and in the knowledge that we won," he wrote, adding that he would continue to serve as an independent lawmaker. His announcement came just days before May plans to trigger on Wednesday Article 50 of the EU's Lisbon Treaty, starting a two-year countdown to Brexit. Carswell's ties with the rest of the party had long been strained, and Farage had accused him of being soft on immigration -- a key issue in the June 23 Brexit referendum. Although Farage is no longer leader of UKIP, last month he asked Carswell to step down, saying he "actively and transparently seeks to damage us". Arron Banks, a key UKIP donor and a key funder behind the Brexit campaign, responded to Carswell's decision by posting a smiling face emoticon on Twitter. "Duplicitous Douglas Carswell, who supports mass immigration, is finally out of UKIP," added a tweet from Banks's Brexit campaign, Leave.EU. "Was he a Tory plant all along?" Carswell was first elected to parliament in 2005 as a Conservative, and his 2014 resignation sparked a by-election in which he was re-elected as a UKIP lawmaker for the southeastern English seat of Clacton. "Like many of you, I switched to UKIP because I desperately wanted us to leave the EU," he wrote. "Now we can be certain that that is going to happen, I have decided that I will be leaving UKIP," he said, adding that "Brexit is in good hands". He said he was not switching parties, which meant there would be no need for a new election. "I will simply be the member of parliament for Clacton, sitting as an independent," he said. Carswell paid tribute to UKIP's efforts, saying that despite their failure to have more MPs voted into parliament, "In a way we are the most successful political party in Britain ever". He even offered some praise for Farage, who failed several times to win a seat in the Commons, though he is one of 20 UKIP members of the European Parliament. "Make no mistake; we would not be leaving the EU if it was not for UKIP, and for those remarkable people who founded, supported and sustained our party over that period," Carswell said. But his resignation is a blow after months of infighting in the party, which is struggling to find a winning platform beyond its core message of euroscepticism and opposition to mass immigration. Last month UKIP failed to win a by-election in Stoke, the city that recorded the highest vote for Brexit last year and which had been viewed as the party's best hope to win a second MP. "Maybe Carswell senses the changing wind? Maybe he walked before he was pushed?" Matthew Goodwin, an expert on the political right, posted on Twitter. "Maybe he should never have joined UKIP in the first place? Farage never saw Carswell as 'true UKIP'," he added. For Tim Farron, leader of the pro-European Liberal Democrats, Carswell's decision to quit showed that the party had outlived its usefulness. "UKIP have no purpose. Theresa May is now effectively UKIP's leader and has adopted their hard Brexit agenda," he said.